Great to be back in the pool this morning. 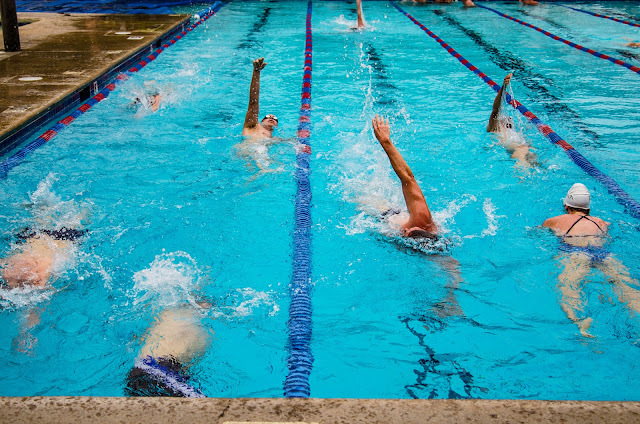 Swimming works as a reset for other tasks. I missed all my swim workouts last week. Every day was booked with early start times for video productions far from home. I did get back in the water on Sat. and Sunday but I was really looking forward to getting back to my routine today. I woke up five minutes before my alarm this morning; it was 5:55. I made some Irish breakfast tea with a little milk in it, read the news feed on my laptop and then grabbed a clean towel and headed to the pool. The pool is a five minute drive from the house. On the way over I was being self-analytic and trying to come to grips with some anxiety. I have two big video projects in house and they both have the same, fast approaching deadline. I was having trouble getting started on the editing for the biggest one. It's hardest, I think, to decide on how a video will open; that sets the stage for everything else. Somewhere in the middle of a hard set in the pool my brain unclenched from its bulldog tenacious grip on the editing and I started just mulling over the possibilities. Over the course of the next mile's worth of interval training I came up with a plan to construct the video story in small, manageable chunks. By the time I got out of the pool I'd ditched my anxious feelings and my need for rigid control of the project and I felt much calmer. I also felt good at getting in a couple miles of hard work before breakfast. Now I'm back in the studio, the subtle perfume of chlorine wafting over from my bag of swim gear, and I'm carefully reviewing and cataloging snippets of the 2.5 hours of "footage" we've got in the can. If I find a few holes I still have time to shoot a bit more but I think we're pretty well covered. For those who are interested in video.... I've been using Final Cut Pro X as my non-linear editor. It's not that I'm somehow against using Adobe's Premiere but this is what I learned on and have used for the last two years. In the back of my mind I think about the possibility that Apple might pull the plug on further FCPX development as they did with Aperture and I think about switching to the Adobe product. I'd be interested to here what other people's experiences have been like using Premiere. All of the footage we're editing for this video was shot in 4K with three different cameras. The primary camera was the RX10mk3 and most of the "B" roll content came from the RX10mk2. I've pulled out the a6300 to use on some action shots that required stable and accurate focus tracking. All the material matches up well and since I worked hard at keeping the ISOs under 640 we're not having issues with noise. On a cheery note the only day I will miss swimming with my master's team this week will be on Thursday. Maybe I'll do a double on Friday. It's sure better than missing an entire week! The final set was 3 X (2 x 50 yards kick + 2 x 75 yards sprint, both on an interval of 1:05) = 750 yards.